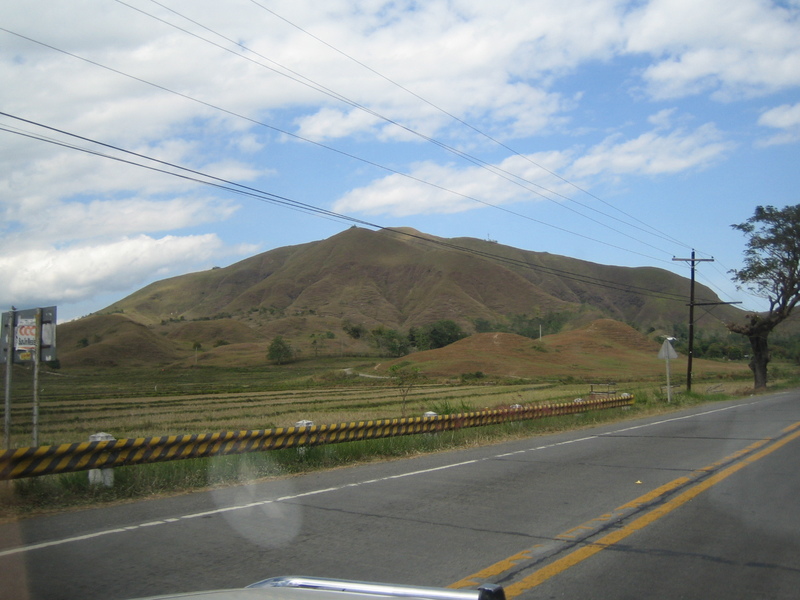 To continue with Part 1 of my feature on Cagayan Valley Roads, the following photos were taken along the national roads from Nueva Vizcaya to Cagayan (Tuguegarao). The hills seem to be silent witnesses to intense logging in the past that has left us with a lot of barren hills and mountains. I could only imagine how these hills could have looked like if there were still trees. 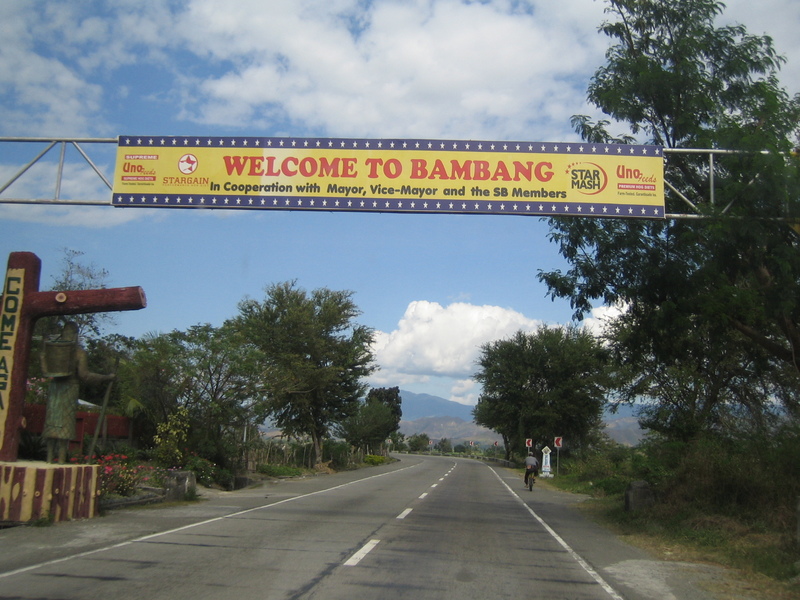 Entering Bambang, Nueva Vizcaya, I was a little disappointed that there was no grand arch like those marking boundaries in other cities or towns along national highways. Instead, there’s this sponsored sign on a gantry. 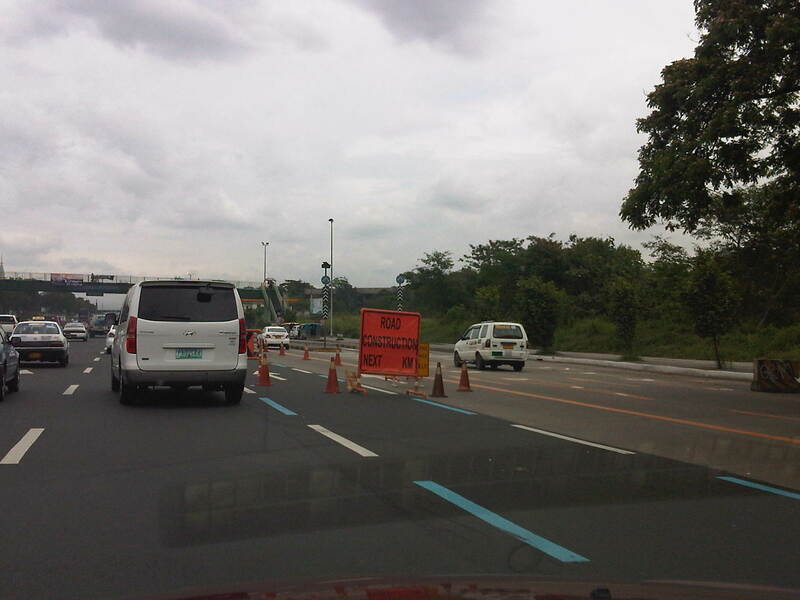 Ahead, some of the chevron signs have been stolen, leaving only a few installed and empty posts. Reverse curve section with concrete barriers to keep cars from going off-road and into the ravine on the right. These barriers, however, will be unable to stop larger vehicles. I was both a bit surprised and delighted that tricycles used the shoulder (or is it parked?) and got out of the way of general traffic. I now forget the exact name of the place but this is somewhere in Bambang in Nueva Vizcaya and the tricycles here are not garapal users of the road. 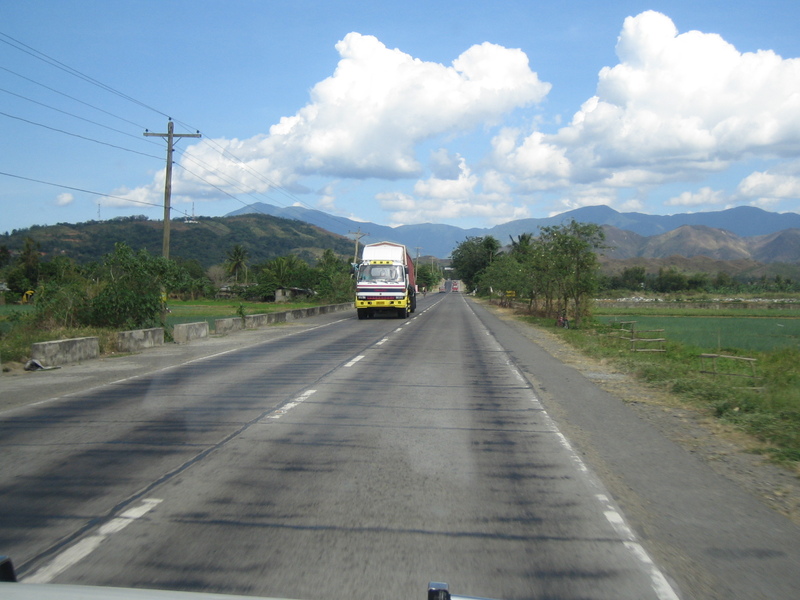 There are many trucks traveling along the Pan-Philippine Highway as this is a major route for a lot of goods. 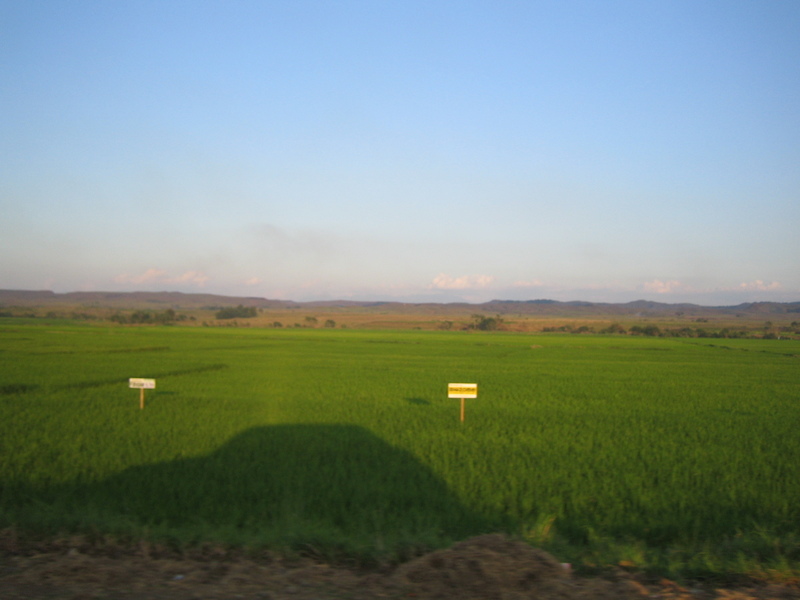 Isabela province, for example, produces rice that is transported mainly to Central Luzon and Metro Manila. This typical 2-lane concrete bridge is relatively new judging from the 20-ton limit indicated in the sign. 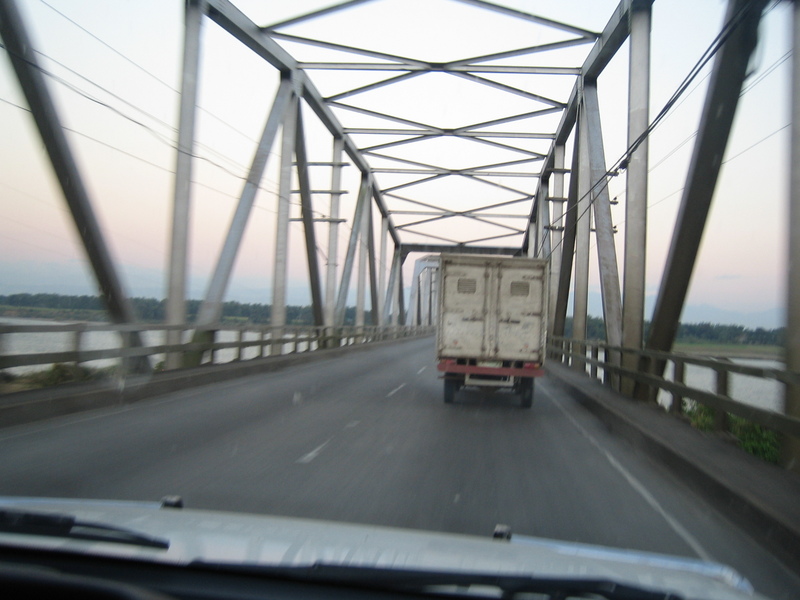 Older bridges would have 15-ton limits. 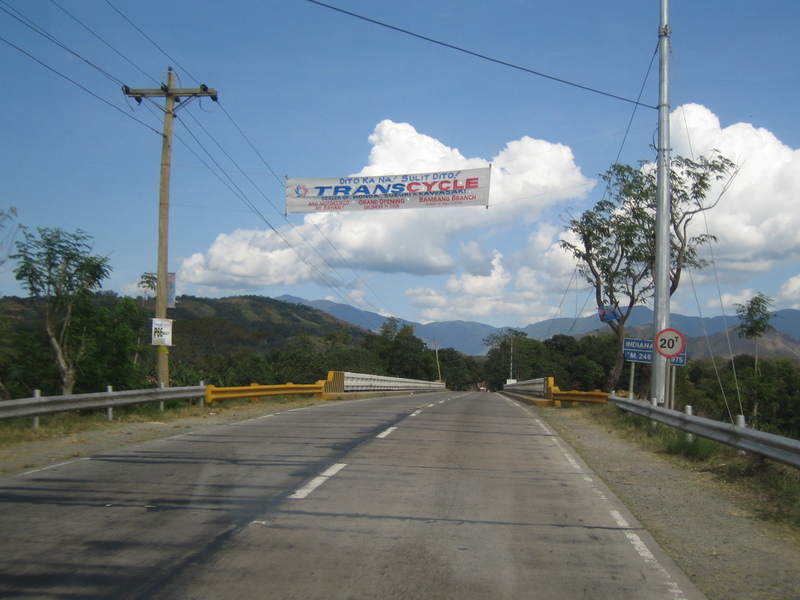 The sign before the bridge allows motorists to assess distances to major towns along the highway: 8 km to Bayombong, Nueva Vizcaya, 13 km to Solano, Nueva Vizcaya, and 70 km to Santiago, Isabela. The two-lane bridge doesn’t have enough space for pedestrian use or breakdowns. 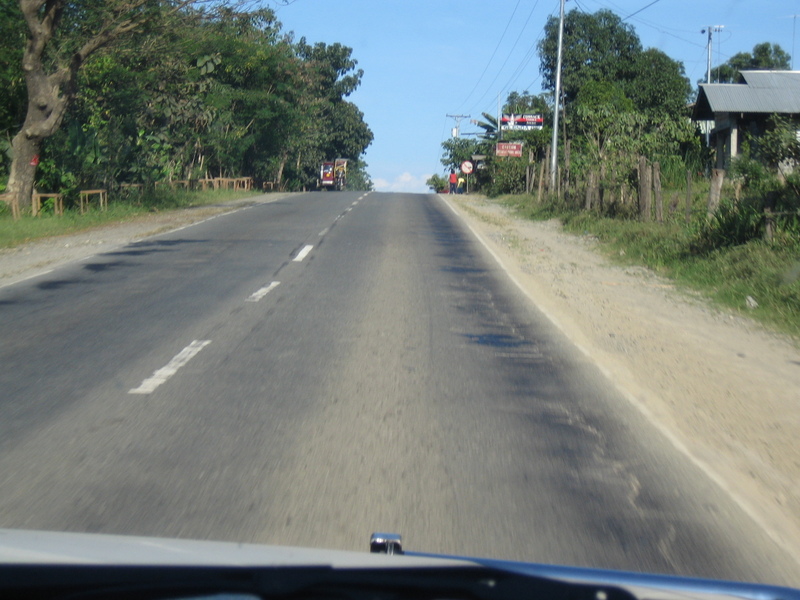 There are many straight, long sections like this between Bayombong and Bagabag. 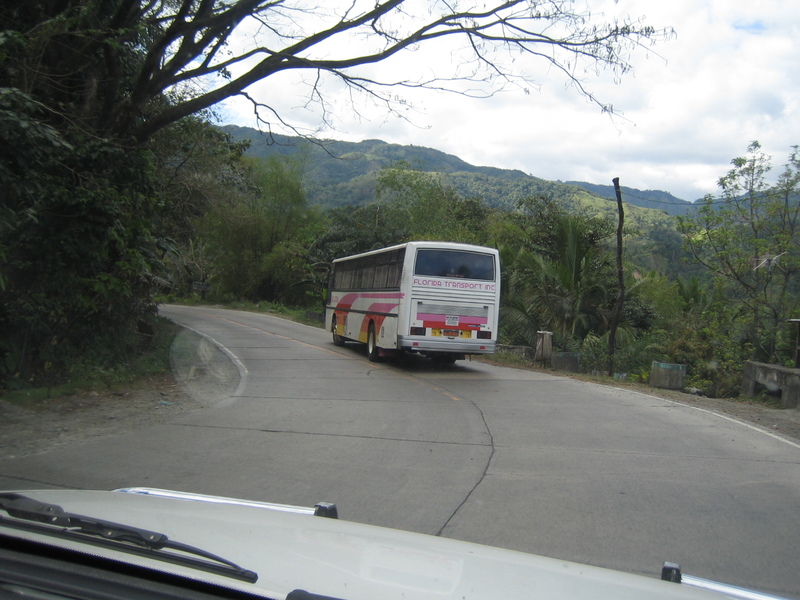 I forget now but this section is also likely to be somewhere between Bagabag, Nueva Vizcaya and Cordon, Isabela. 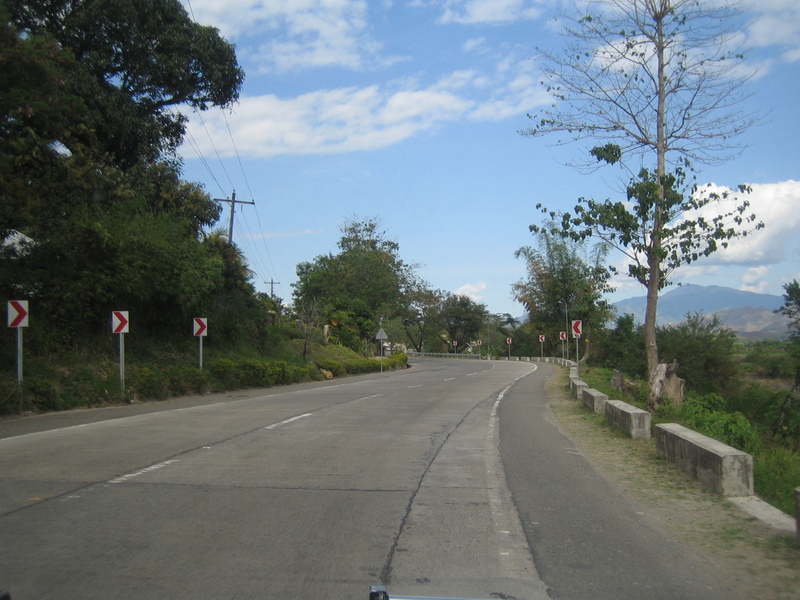 Bagabag is close to the provincial and regional boundary with Banaue Province (Cordillera Autonomous Region) and there are signs pointing travelers to roads going to Baguio City and Lagawe. 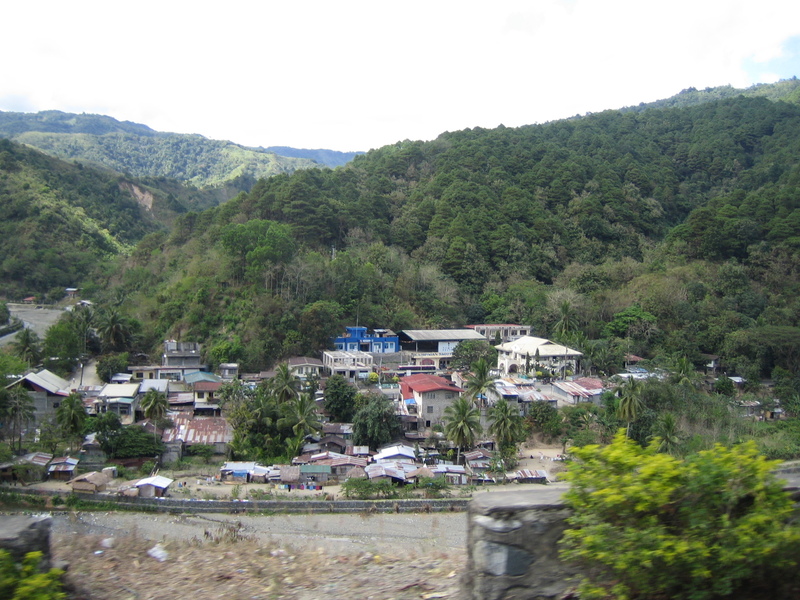 I forget now but this section is also likely to be somewhere between Bagabag, Nueva Vizcaya and Cordon, Isabela. 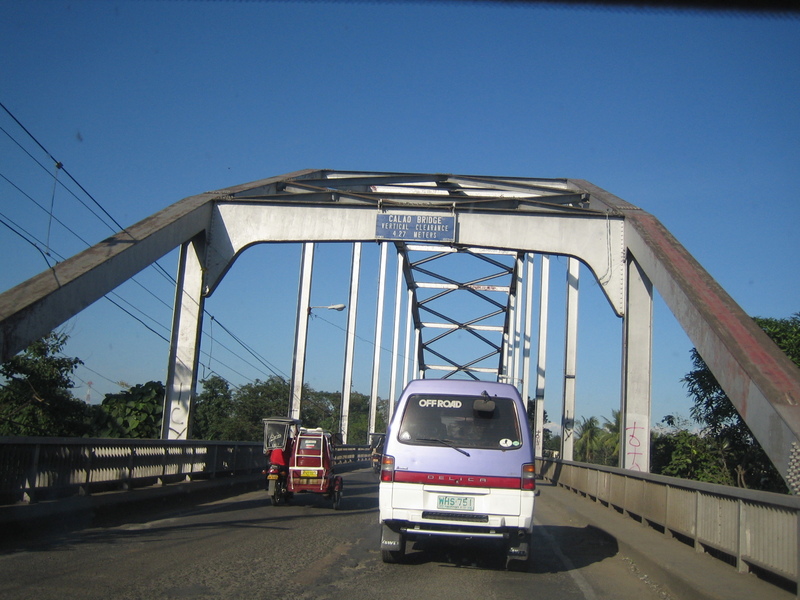 Calao Bridge in Santiago City, Isabela is an example of old school bridgework using steel trusses. 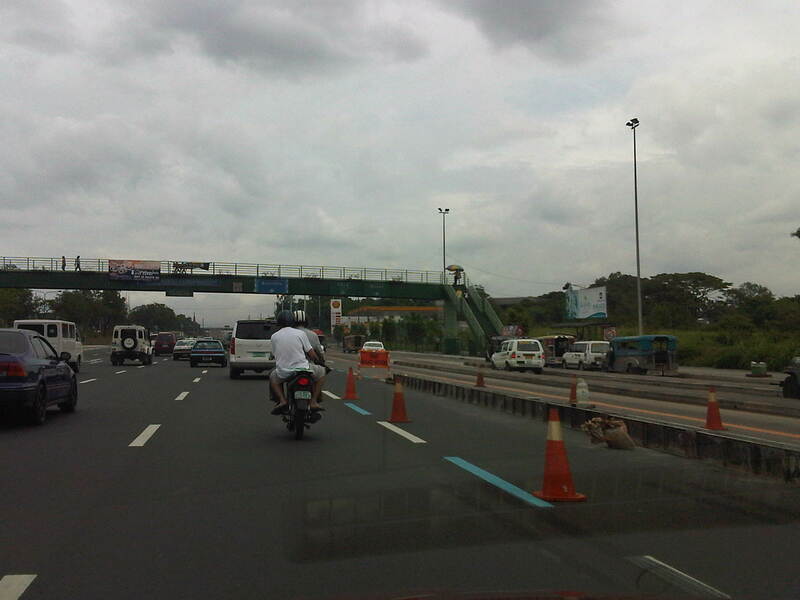 It is similar to many other bridges including those still standing in the Visayas and Mindanao. 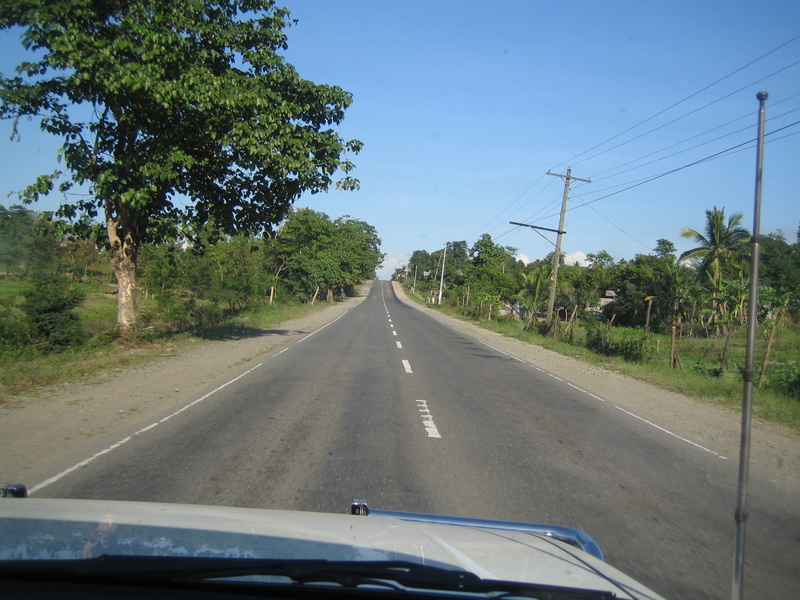 From Santiago City, we decided to take the alternate route using the Santiago-Tuguegarao Road. 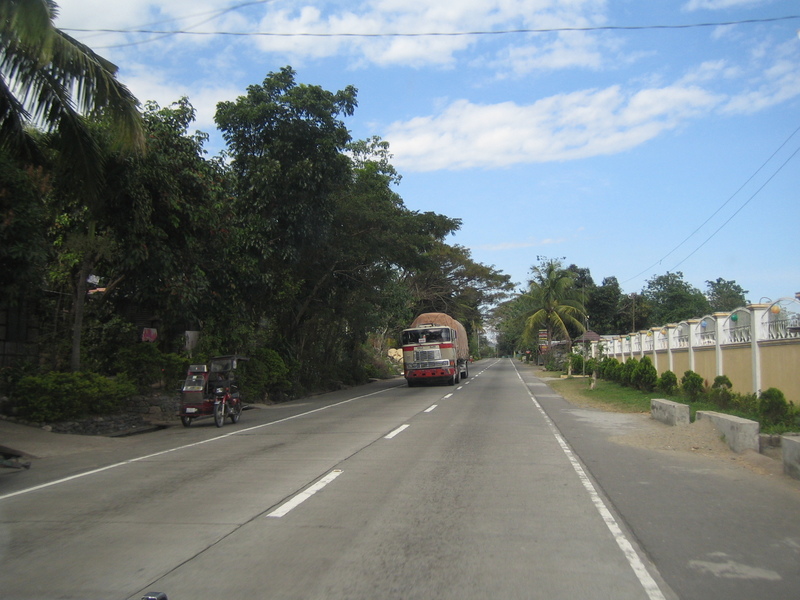 Our assessment was that this would be less congested compared to using the Cagayan Valley Road, which passes through more populous towns like Cauayan and Ilagan. 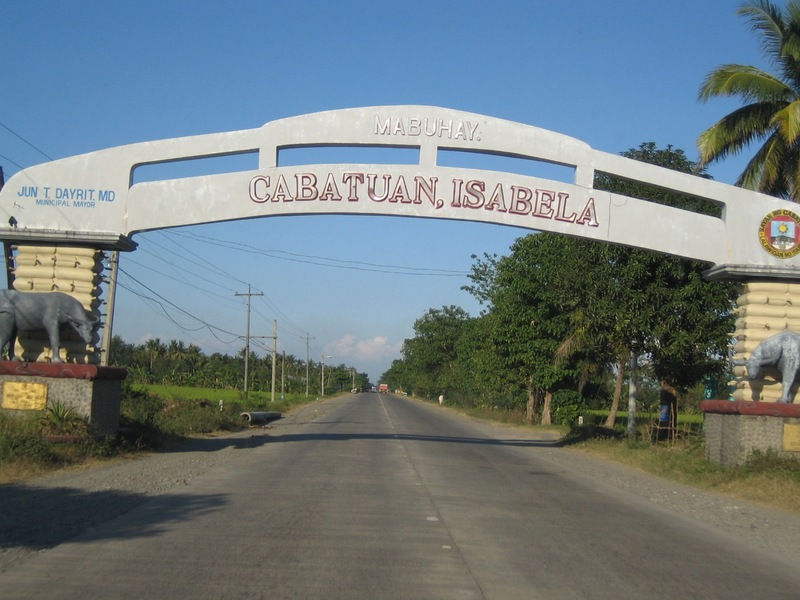 Arch announcing our arrival at Cabatuan, Isabela province along the Santiago-Tuguegarao Road. 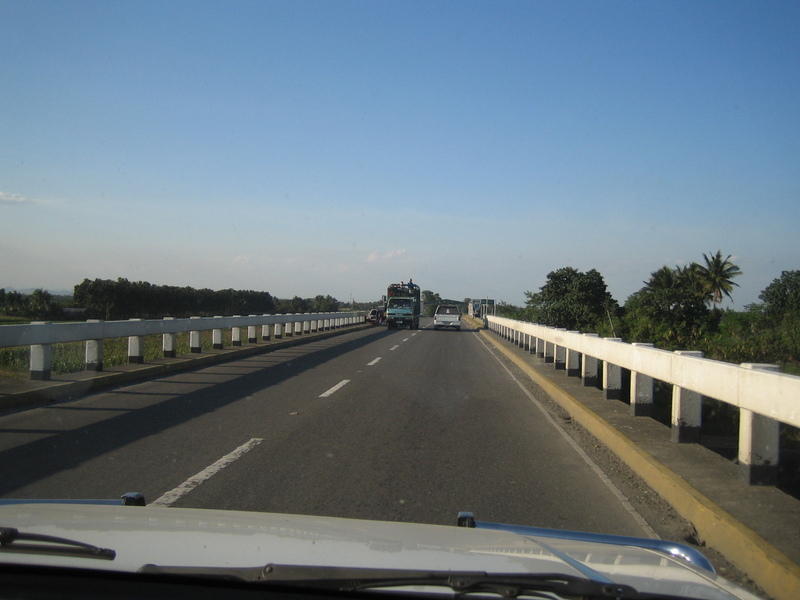 Typical two-lane bridge in Isabela along the alternate route to the Cagayan Valley road. Our decision to take this road seemed to be a good one as traffic was very light and we could travel without worrying too much about tricycles or pedestrians. 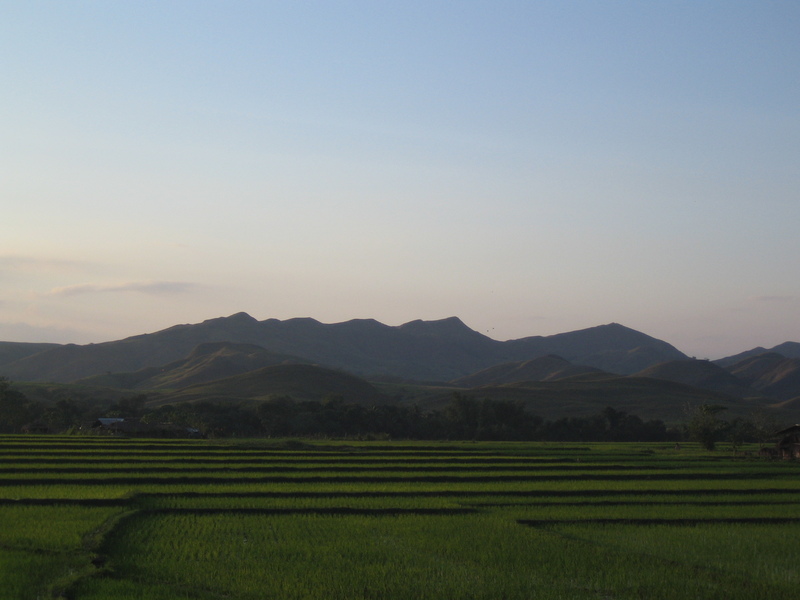 There were rice fields on both sides of the road. The concrete pavement was satisfactory and allowed us to travel at high speeds. Fortunately, there were few communities and people living along the highway at the time. 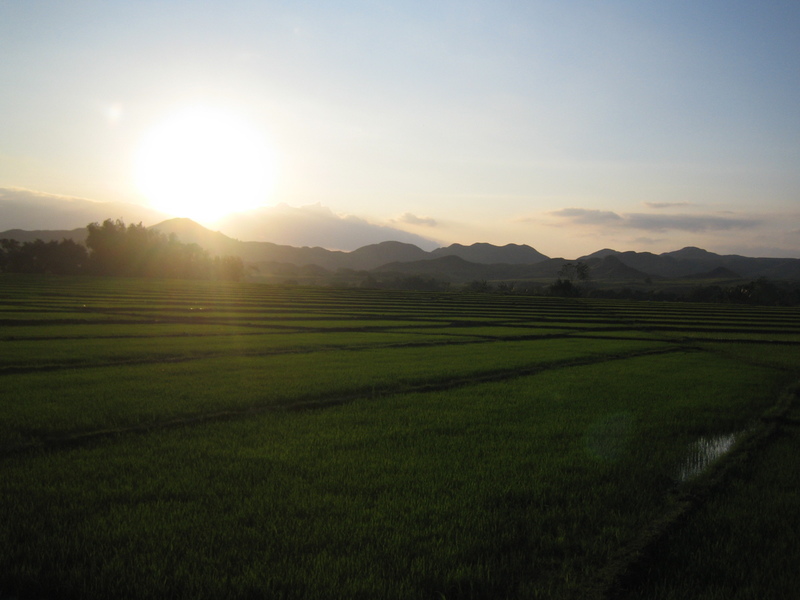 I like seeing rice fields with the plants growing and the greenery indicating its is well-irrigated. This was taken in mid-February so I am pretty sure that since it was months before the wet season, the area had an abundant harvest. 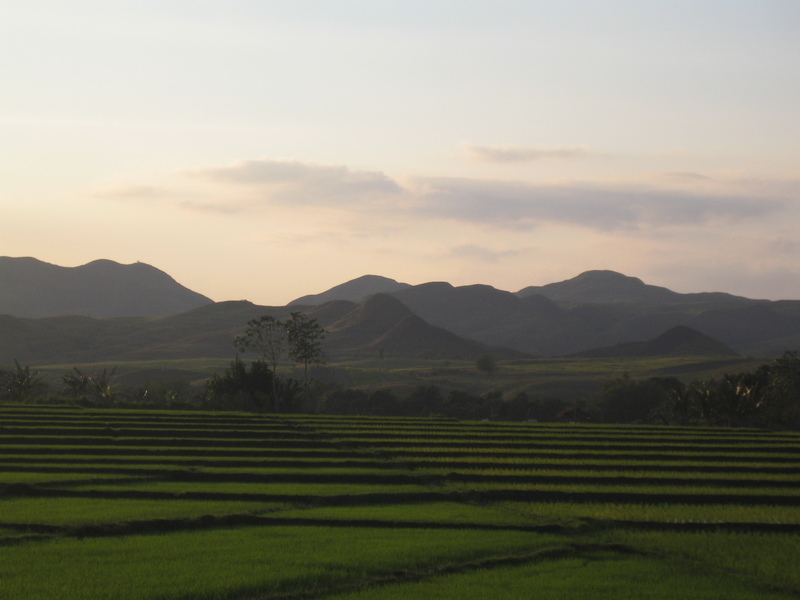 The light from the sunset presents travelers with surreal sights with the rice fields and the mountains often combining for picture-perfect moments. I took this with my Canon Ixy on-board a moving vehicle! 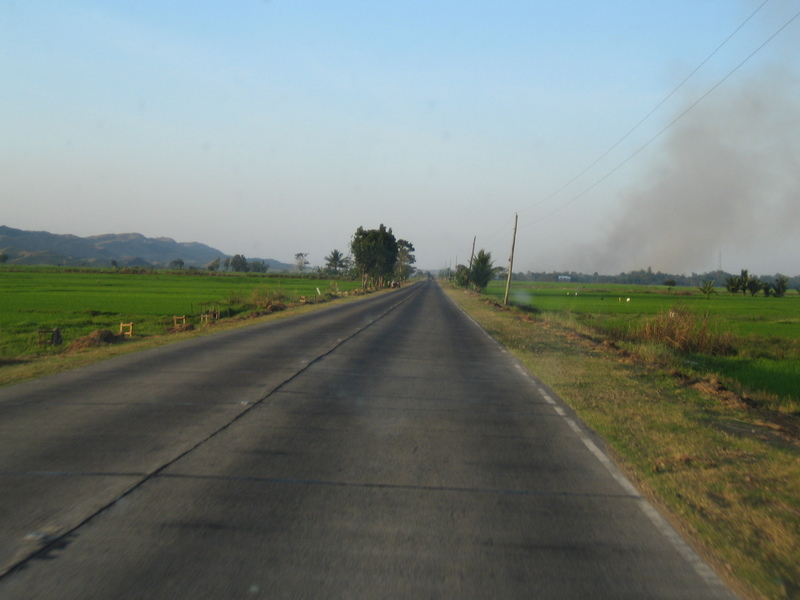 Another shot of the country side along the Santiago-Tuguegarao Road. 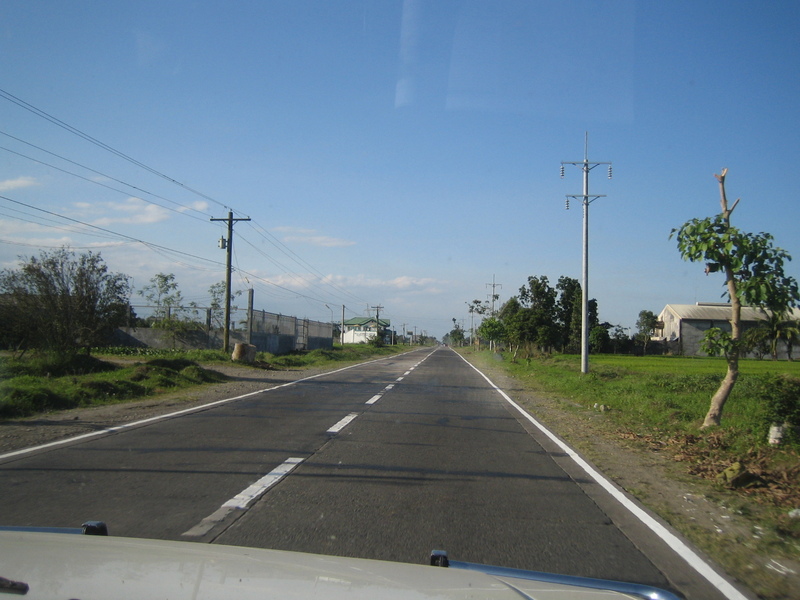 This highway will actually pass through Kalinga province and there is a junction after Quezon town where travelers can turn left towards Tabuk, the capital town of Kalinga. 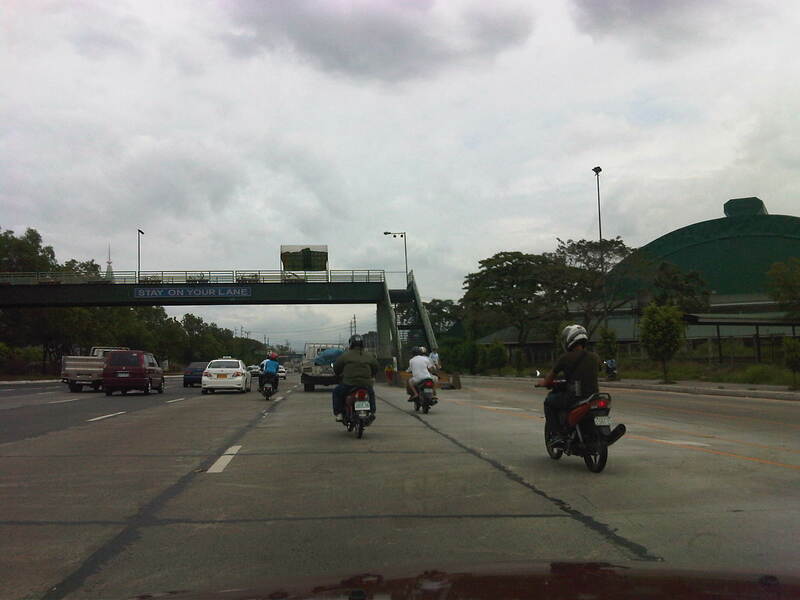 Crossing the Buntun Bridge after Enrile town brings the traveler to Tuguegarao. The bridge spans the width of the Cagayan River, the longest and largest river in the Philippines, which deserves to be called by its name during the Spanish period – Rio Grande de Cagayan. 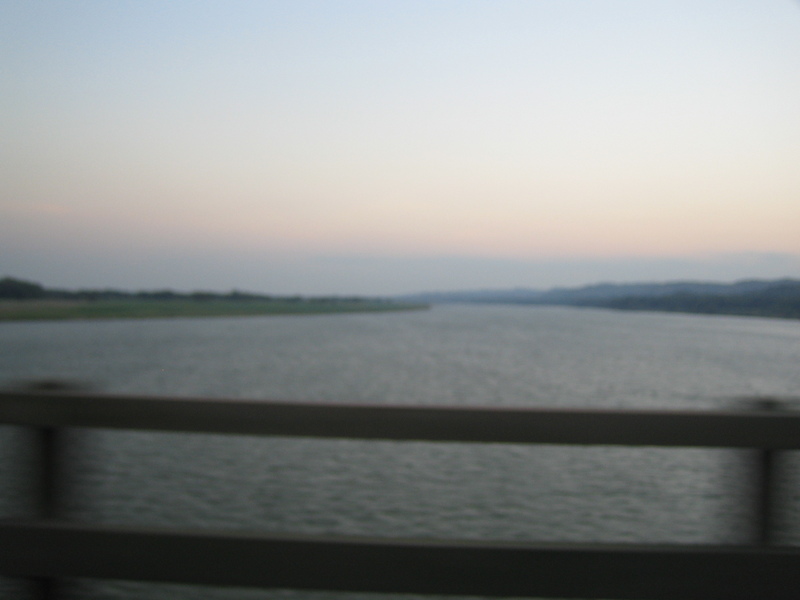 Cagayan River is a wide body of water that is navigable and the source of fresh water for a lot of people in the Cagayan Valley. 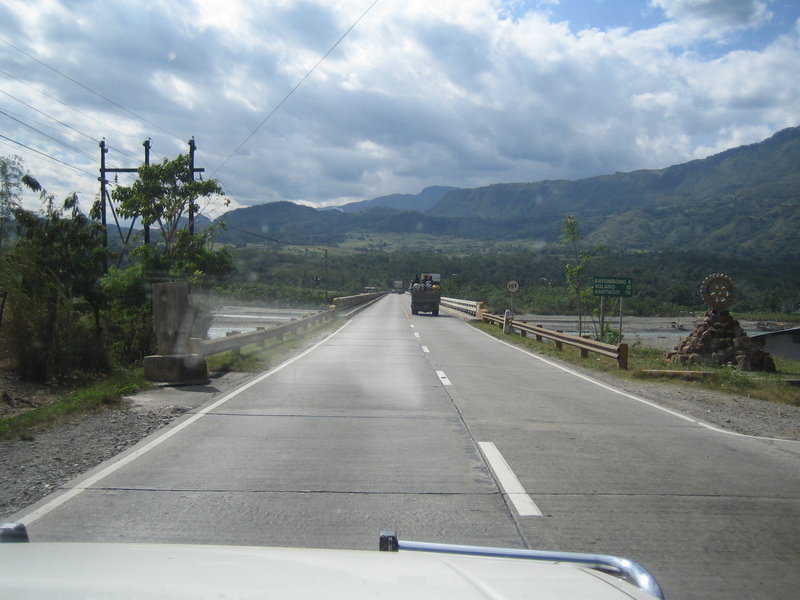 It stretches from Aparri to Dupax Del Sur, Nueva Vizcaya near the Nueva Ecija province and Pantabangan Dam. The river and its tributaries cover practically the entire valley of 4 provinces (Cagayan, Isabela, Quirino and Nueva Vizcaya). Reviewing these photos and trying to remember the places is like reliving the journey. I am sure there has been a lot of changes since I took these photos in February 2007. Perhaps there have been substantial developments along the highways and there are more people living in those communities we passed by. 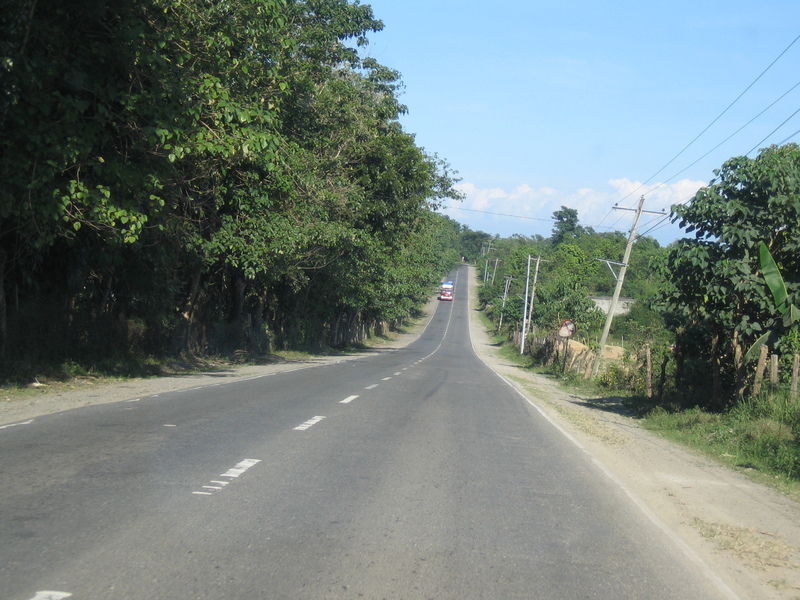 Perhaps, too, there is more vehicular traffic along these roads, a definite sign of progress in these areas. I just hope that there would be more and not less trees in those hills we passed along the way. 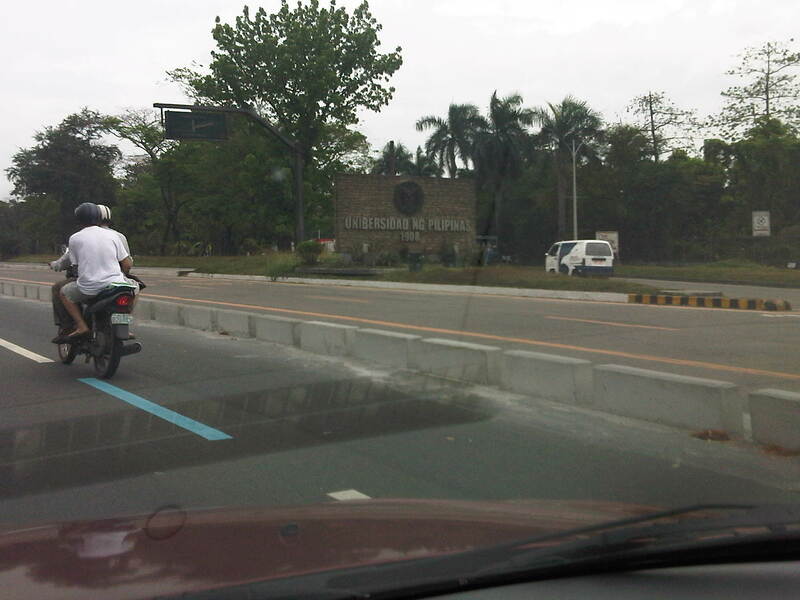 The following photos are just takes on EDSA during one of those trips from a meeting to go back to the university. The pictures show what we encounter everyday along what may be the busiest thoroughfare in the country. 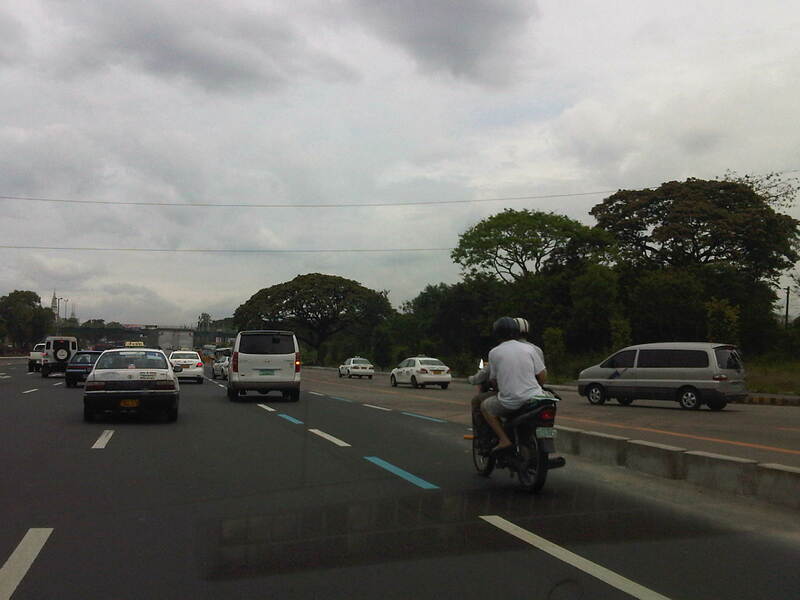 Of course, it goes without saying that similar scenes are also observed along other roads including expressways. Visual noise – the billboards along EDSA remain to be a source of “visual noise” as some architects and planners refer to their proliferation. There are a huge concentration of these billboards in the Guadalupe area including LED screens that literally light up the road. Not a few people including MMDA Chairs have called for the removal of the billboards or at least regulating their content. With summer approaching fast, the models might have lesser clothing on them and become more of distractions for motorists and riders. 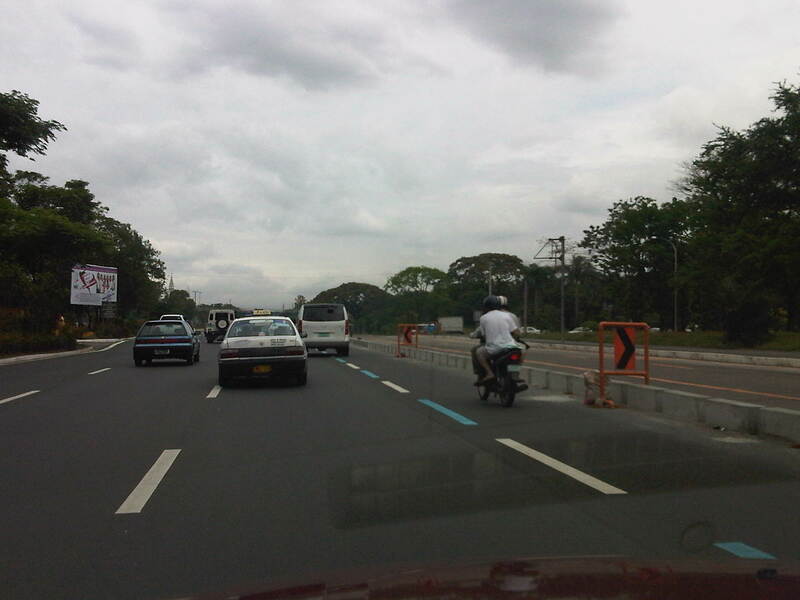 Motorcycle lane – the imposition/implementation of motorcycle lanes along EDSA has received mixed feedback from various sectors. 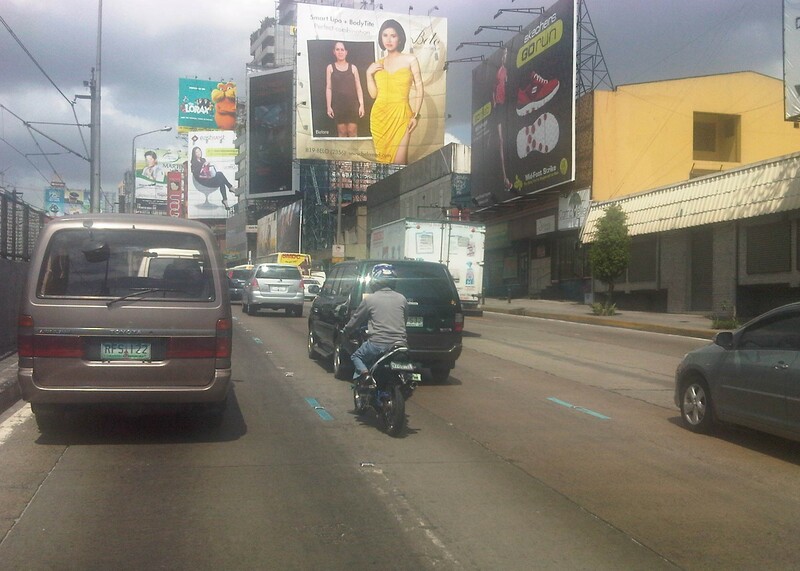 Unlike Commonwealth, EDSA’s traffic is significantly higher and the latter has less lanes and so during peak periods, there is no choice for motorists but to use the motorcycle AND bus lanes. The result is a chaotic mix of vehicles jostling for road space especially along areas where bus stops are located. 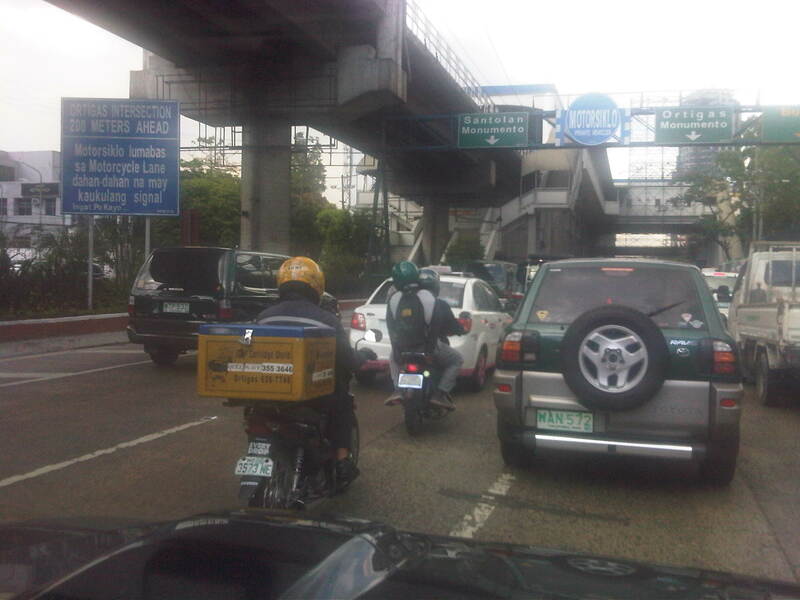 NMT lane-splitting – I was fortunate to be able to capture this scene where a man on bicycle splits the lane along EDSA. The lane here is actually part of the 2 outermost lanes designated for buses (yellow lanes). However, in the vicinity of intersections, private vehicles are tolerated to use the lanes as the turn into or off from EDSA. 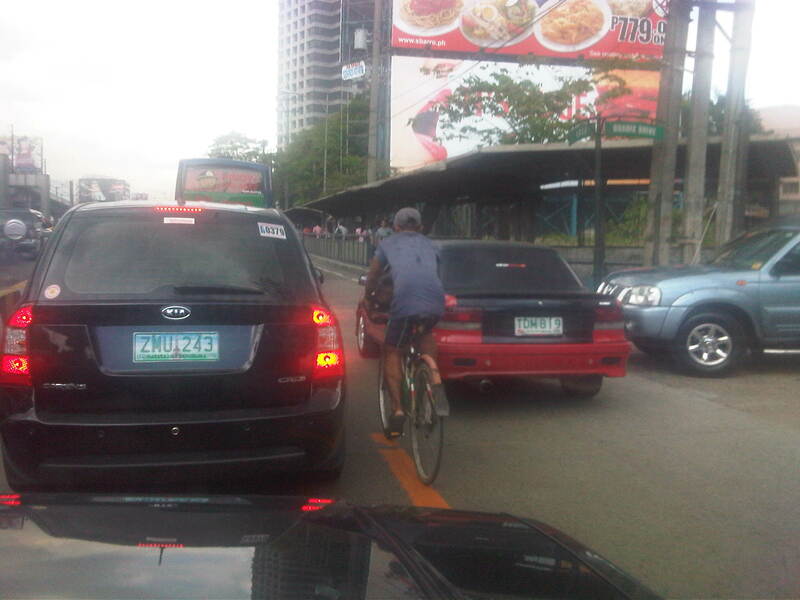 I don’t think there is good data on how many bicycles travel along EDSA (or sections of the highway) everyday. This would be an interesting statistic that could enable us to determine the demand for cycling along this highway. Another article came out today, this time from GMA News about the NEDA’s approval of a PhP 21.5 Billion project for electric tricycles. The approval of the project is said to be based on the evaluation of a feasibility study submitted by its proponent, the Department of Energy (DOE). I have not yet seen this FS and I am not aware of any formal studies in this regard that has been made public so I cannot make a fair comment with regards to what the NEDA had as reference materials in their assessment. I am aware of one private initiative where UP was involved but to my knowledge this has not been disseminated or shared by the Client to government agencies. Though caution is still very much necessary and desired when moving forward with this e-trike project (What would happen to spent batteries? Is there adequate technical support? Charging stations? Policies regarding phasing out conventional tricycles? ), it is hoped that this will be one of those “tipping point” moments that will ultimately benefit the country. The National Economic and Development Authority (NEDA) approved a P21.5-billion project to promote sustainable transportation and achieve energy efficiency. The Market Transformation through Introduction of Energy Efficient Electric Tricycle (E-trike) Project will reduce fuel consumption of tricycles by 2.8 percent, equivalent to 560,926 oil barrels, NEDA said in a statement Monday. “The project will distribute 100,000 E-trikes to tricycle operators on a lease-to-own arrangement, replacing their old gas-fed and two-stroke gasoline engine units. This way, we are also able to protect our environment,” according to NEDA, citing Socioeconomic Planning Secretary and NEDA board vice chair Cayetano W. Paderanga Jr.
“The electric tricycle is a specially designed, highly efficient tricycle that runs on a motor powered by a battery charged by electricity. E-trikes produce no noise, no tailpipe emissions, and represent an opportunity to make public transportation in the Philippines more environmentally conscious while improving the livelihood of tricycle drivers across the country,” reads the project description on the website of Asian Development Bank, which is financing part of the project through a P12.9-billion loan. The project was proposed by the Department of Energy (DOE). Additional financing will come from the Clean Technology Fund (P4.3 billion loan and P43 million grant), Clean Development Mechanism facility (P860 million), Philippine government counterpart funding (P3.397 billion). According to the DOE, the design is optimized to ensure structural integrity. ADB explained that the project gives tricycle drivers the opportunity to lease or lease-to-own the E-trikes by paying less than 200 pesos a day, which translates to a higher take-home income. “For example, a conventional tricycle needs between 5 and 7 liters of gasoline to travel approximately 100 kms, costing P250 to P350. To travel the same 100 kms, an E-trike will use between 3 kWh and 5 kWh of electricity, costing only P30 to P50. The 200 peso difference in fuel savings will help the driver pay for the cost of the E-trike,” ADB added. The pilot project was launched in April 2011, with 20 E-trikes deployed in Mandaluyong City. The E-trikes use two different types of lithium ion battery technology—the 3 kWh and 6 kWh battery packs. Models with the 3 kWh battery pack can run as far as 50 km on a single charge, and can be recharged to 80 percent in under 30 minutes at fast charging stations. Models using the 6 kWh battery pack can go up to 100km on a single overnight charge. Sen. Edgardo Angara, who heads the Congressional Commission on Science, and Technology, and Engineering, lauded the E-trike project, saying the use of e-vehicles could lower air pollution levels and lessen the dependence on oil. “Once thousands of E-trikes begin to be manufactured, many new jobs could be created. Working together, we can give Manila cleaner air, bluer skies, and a more livable environment,” Kunio Senga, director-general of ADB’s Southeast Asia Department, said in an earlier report. The Quezon City government is preparing pilot test the E-trikes. According to a news release, the city has conducted an Eco-Driving Training for Quezon City Tricycle Operators and Drivers Associations (QC-TODA). Discussed was the impact of good driving behavior, proper engine maintenance for lesser emissions and reduced maintenance cost as well as increased fuel saving for the current conventional tricycles operating in the city. QC will be given 22,000 E-trikes over five years—the largest allocation among LGUs in Metro Manila—2,000 this year and 5,000 every other 4 years. “The project is expected to complement the city government’s continuing effort to mitigate the ill effects of pollution on public health and safety. This would also pave the way for the gradual phase-out of conventional tricycles now plying city roads,” according to a statement by the Quezon City government. Under Phase I of the project, 20,000 E-trikes will be distributed to operators in Metro Manila, Boracay, Puerto Princesa City, Cabanatuan City, and Davao City from 2012 to 2013. Eighty thousand units will be distributed to operators in municipalities and cities that are still to be determined under Phase II (2013 to 2016). NEDA said the project aims to promote, establish and develop electric-vehicle support industries such as battery leasing, recycling and disposal, and motor supply chain and charging stations. But the Electric Vehicle Alliance and the Partnership for Clean Air are questioning the project, saying its funds were reallocated from the renewable energy industry—originally stipulated in the Clean Technology Fund. Greenpeace is also not happy with the project. “Why are we rushing this project?” asked Greenpeace Southeast Asia campaigner Francis Dela Cruz. they are not necessarily good for the environment. “Hindi siya magiging source ng mobile pollution, but because you use power outlets to charge, you are just shifting to a stationary source of pollution—the fossil fuel-fired power plants,” he said. In addition, the project-mechanism that involves LGUs as lenders make the project seem dubious to Greenpeace. 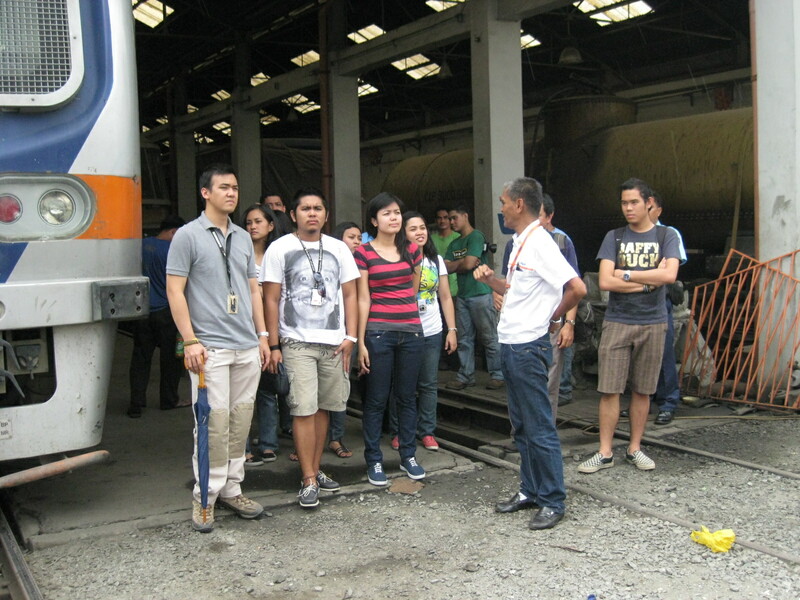 We took our students to a field visit to the Philippine National Railways (PNR) station and depot in Tutuban in Manila. It was a good experience for all of us who joined the trip as the PNR is currently in the process of upgrading their services with the acquisition of refurbished rolling stock and the resumption of services to Bicol. We were quite curious as to the current state of the PNR after what has been a long period of neglect from a government that is supposed to promote safe, efficient and affordable mass transit not just for the urban setting but for long distance travel as well. The PNR station and office building at Tutuban – the old station is actually where the Tutuban is now located. Access to the Tutuban Station is through a gate and the surrounding area is not suitable for a main or central station. There is no station plaza and as we will see in another photo, the space including the platform will not be suitable should operations expand in the next few years. In fact, passengers entering the station are processed as if they are entering an office building. 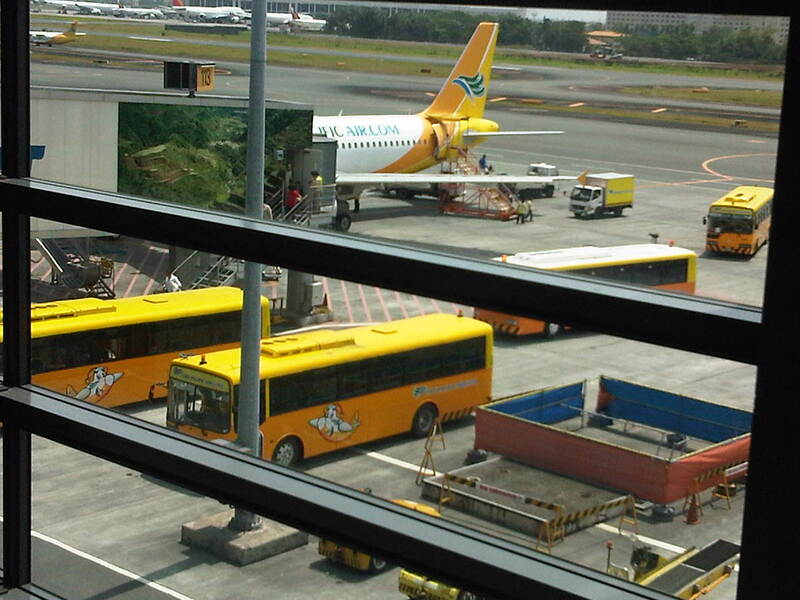 This is partly true as the building serves as head office for the PNR. 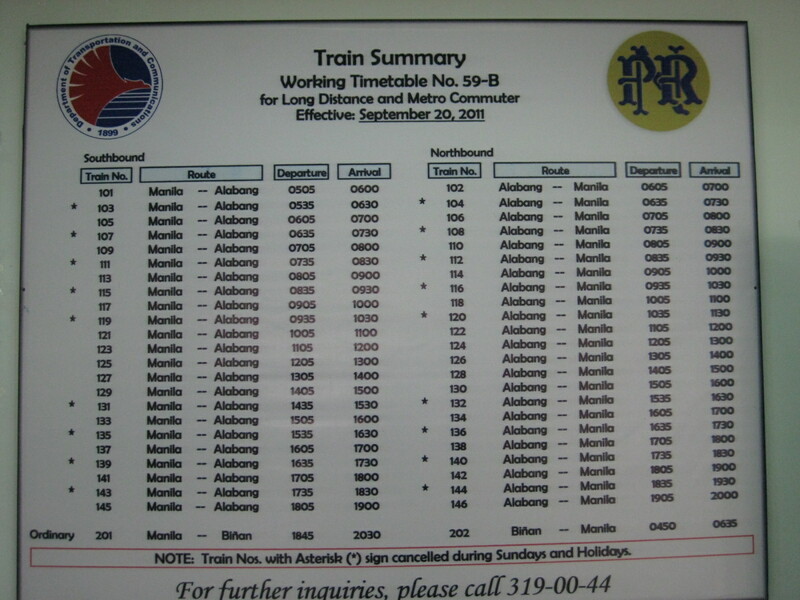 Train schedule for the PNR commuter line – service frequency is still low with headways of 30 minutes (a train every half hour). With the number of passengers steadily increasing, the current capacity of trains has already been exceeded. 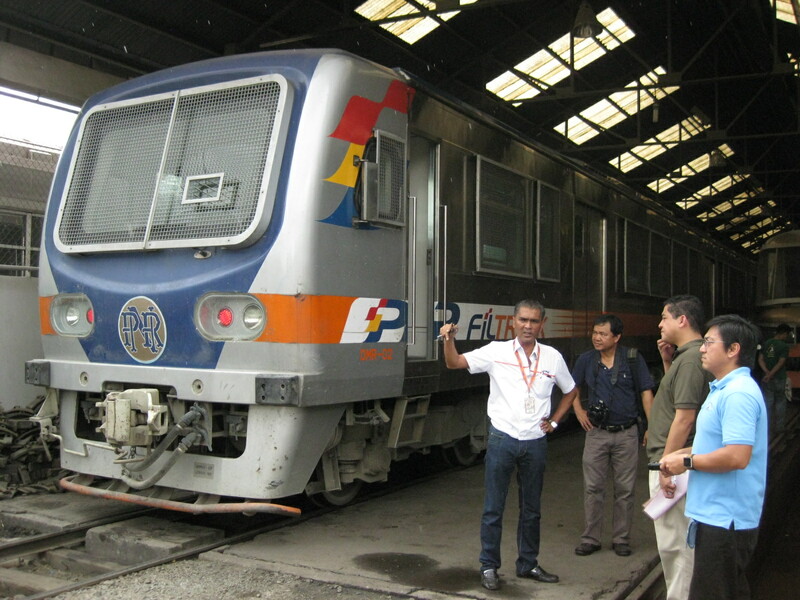 The PNR should resolve issues pertaining to conflicts along its tracks and deploy more trains and/or more cars. 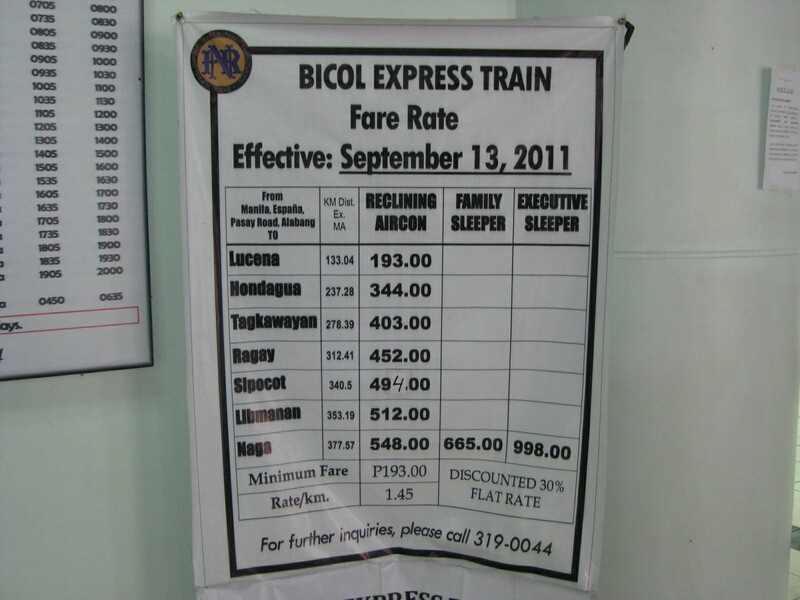 Fare table for the resurrected Bicol Express – family and executive sleepers were supposed to start operation last March 16. We were told that the PNR hosted representatives of travel/tourist agencies to an exclusive initial run of the sleeper and recliner cars to Bicol and back. This was part of the promotion of rail services to travelers especially as the summer months are approaching. 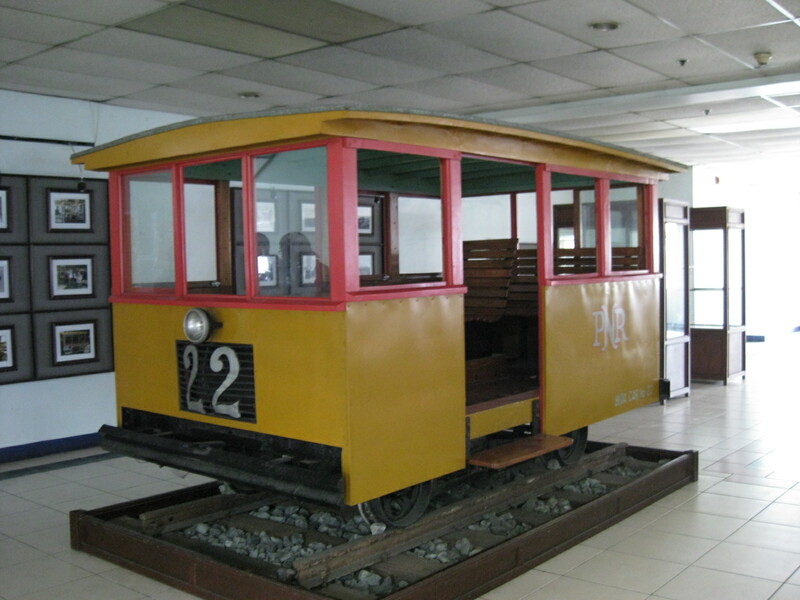 Replica of old PNR train car – there were many photos and other memorabilia on display at the Tutuban station. Unfortunately, the security people seem quite iffy about people taking photos. They had to be told by our host PNR officials that we were visitors from the State University. I found this to be very odd and a definite turn off for people interested in the trains. Rail needs to be promoted and PNR security is not helping in this aspect. 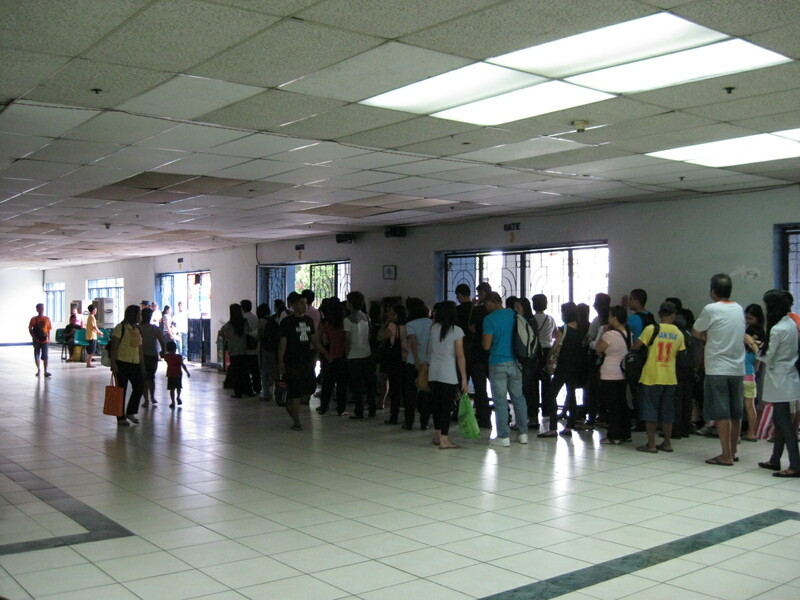 Passengers queued at the Tutuban Station – there were very few seats in the waiting area and passengers who want to board the next train emanating from Tutuban had to stand in line from the gate where PNR staff and security process passengers. A better system should be established here including the introduction of ticketing machines and turnstiles to better serve passengers. It won’t hurt also to have an electronic information system for train schedules and announcements. Maintenance cars – when our hosts led us to the platforms, the first things that caught my eyes were the maintenance cars. 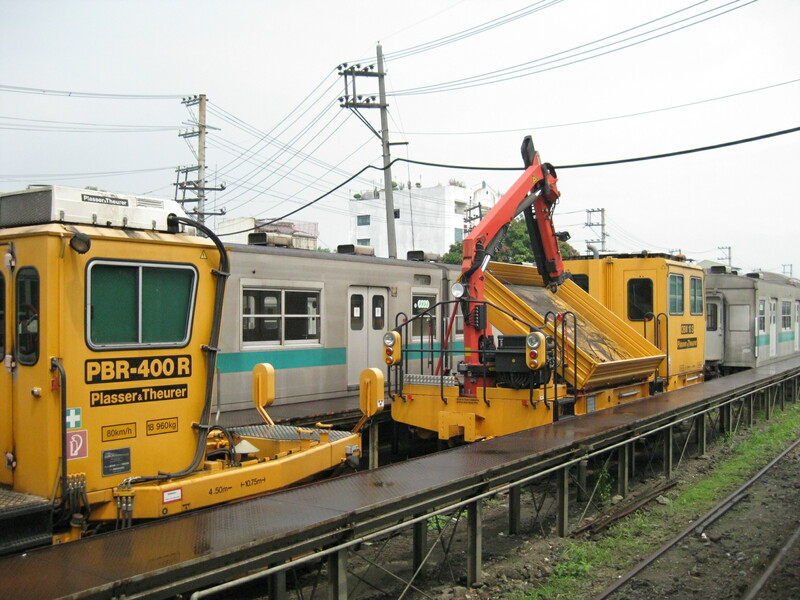 These have allowed the PNR to provide better maintenance work on their tracks, no longer relying solely on manual labor for inspection and other works. Behind the equipment are cars familiar to me and my colleagues – Japan Railways (JR) retired these cars from the Saikyo Line that served areas along a route connecting Tokyo and Saitama Prefecture. 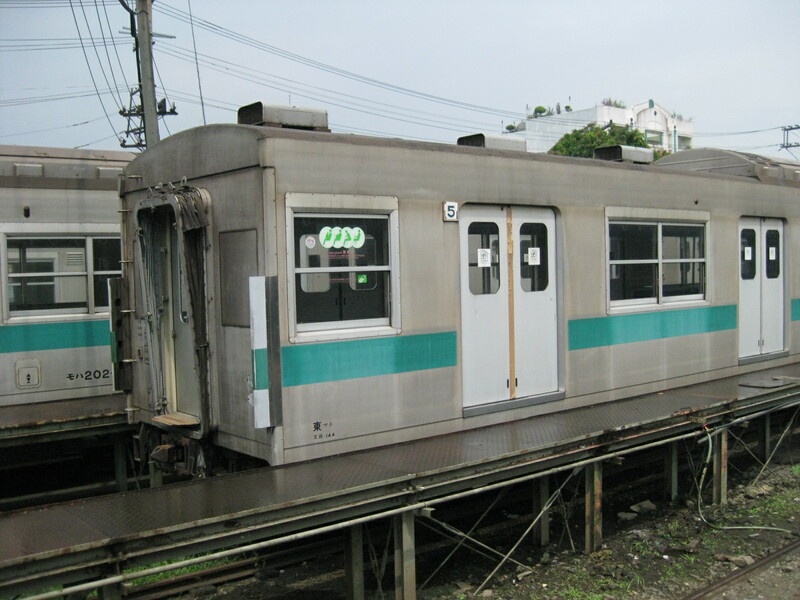 Nostalgic – these cars were the very same cars we used to ride along JR East’s Saikyo Line, which now runs between Omiya in Saitama Prefecture and Osaki in Tokyo via Ikebukuro and Shinjuku. It was usually my choice for going to Tokyo from Saitama University if I was heading to Shinjuku or Shibuya. From the university, I ook a bus to Minami Yono Station where I can also see Shinkansen trains passing through the station. The latter were also headed to Omiya where the Shinkansen lines branch out to Nagano, Tohoku and Akita. 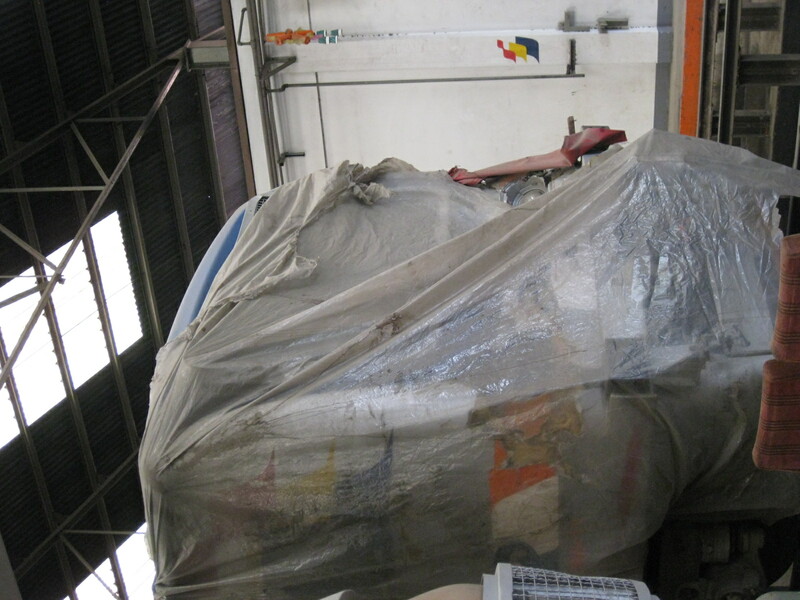 The cars shown in the photos are donations from Japan and the PNR only paid for its transport. 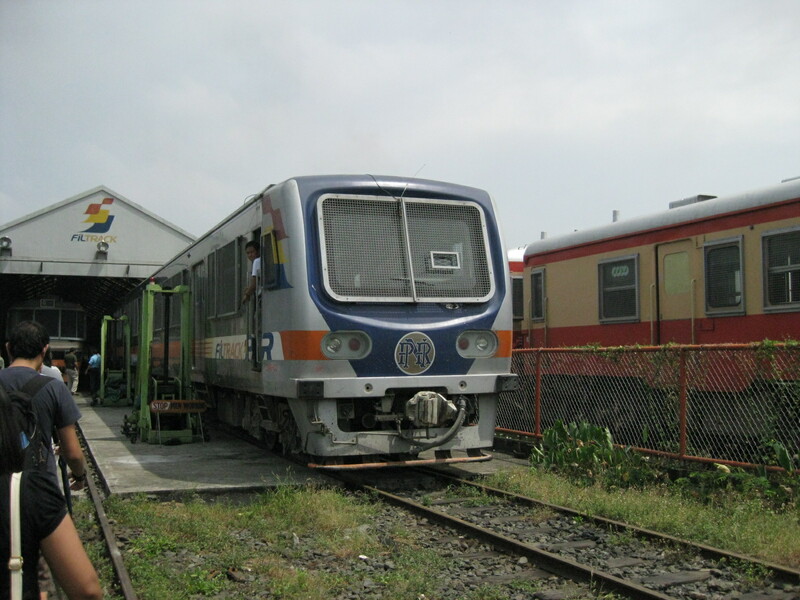 Old and new – old cars of the PNR may also be found at the Tutuban depot like this old passenger coach at one of the platforms. 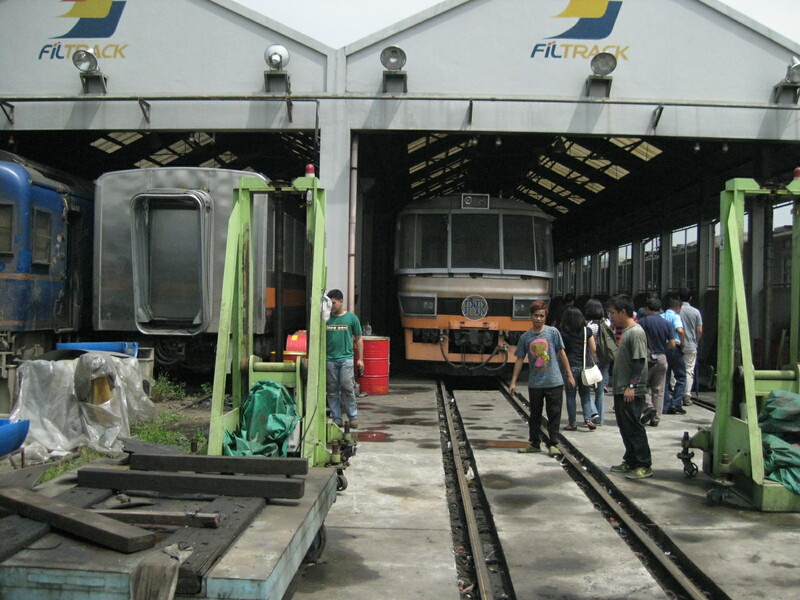 We were not able to ask if the PNR had plans to preserve these old cars. In other countries, there are railway museums like the one near Omiya Station in Japan. I’m sure the PNR would not lack for museum pieces including the old locomotives on display at its gates. Sparkling – The interiors of the commuter trains reflect the service upgrade for the PNR. 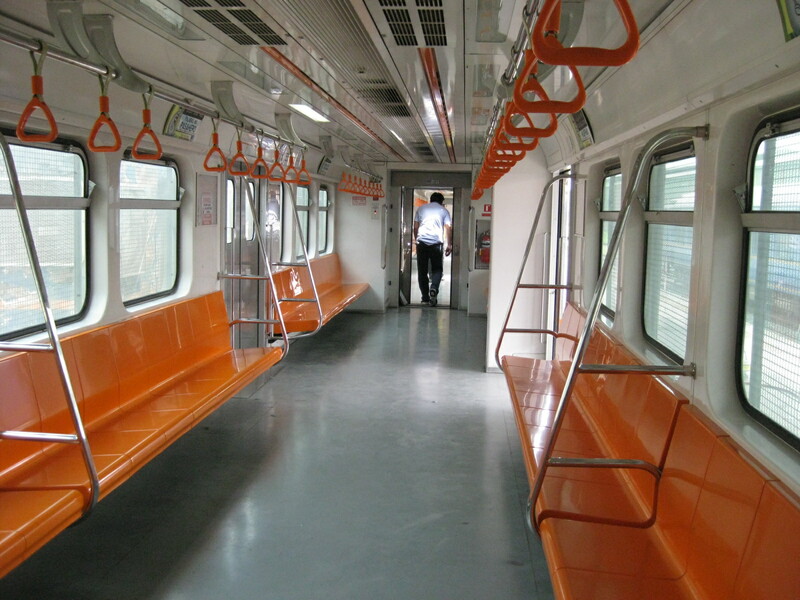 The trains are clean and spacious (appropriate for the capacities required for commuter service). 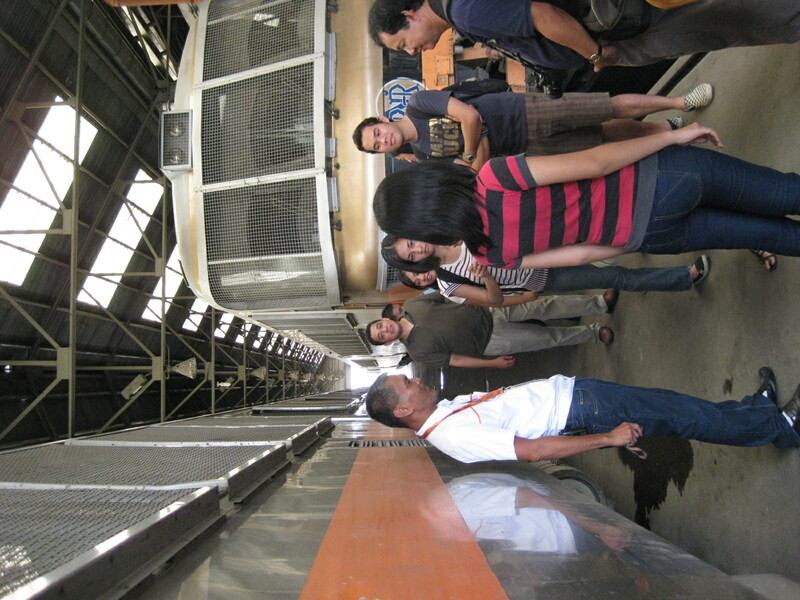 Try-outs – our students and my colleagues try out the seats as we were ferried from the Tutuban platform to the depot where our hosts gave us a technical tour of the rolling stock and other facilities. 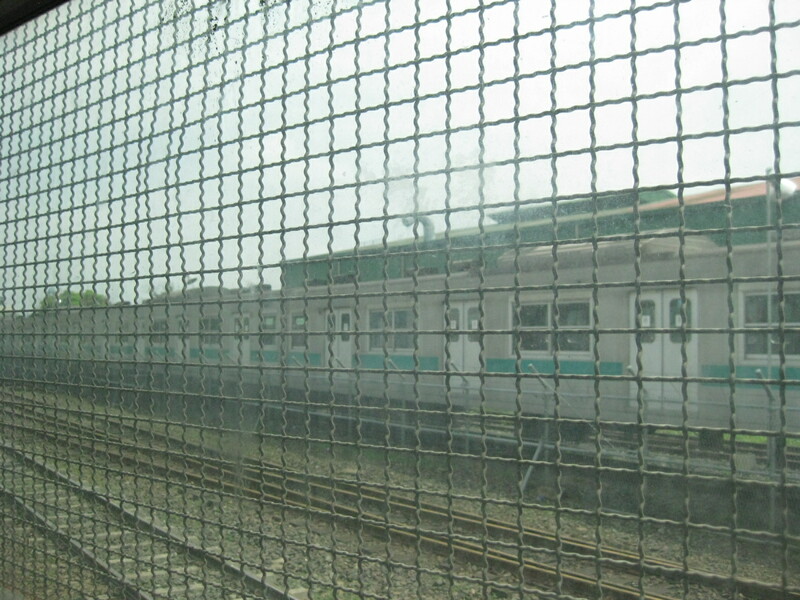 Grilled reminder – PNR coaches have their windows fitted with grills like this on the PNR commuter trains. 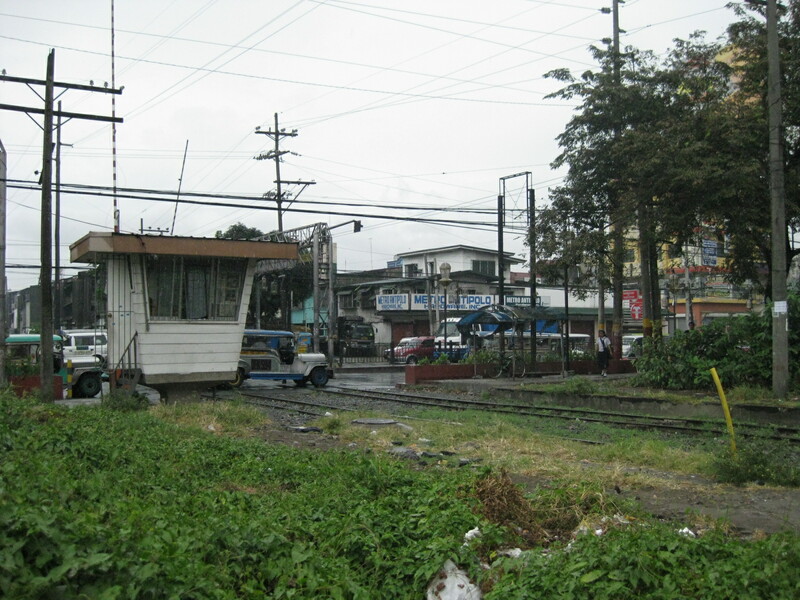 Despite efforts to clear its right-of-way of informal settlers, there are still many along its route and these have often vandalized trains. In many instances, garbage and other items are thrown at the trains. These incidents have been significantly reduces but the PNR continues to experience such, necessitating the installation of grills. The coaches from Japan will not be operated until they are fitted with the same grills. Hopefully, the PNR ROW will be clear of informal settlers as well as other sources of impedance. 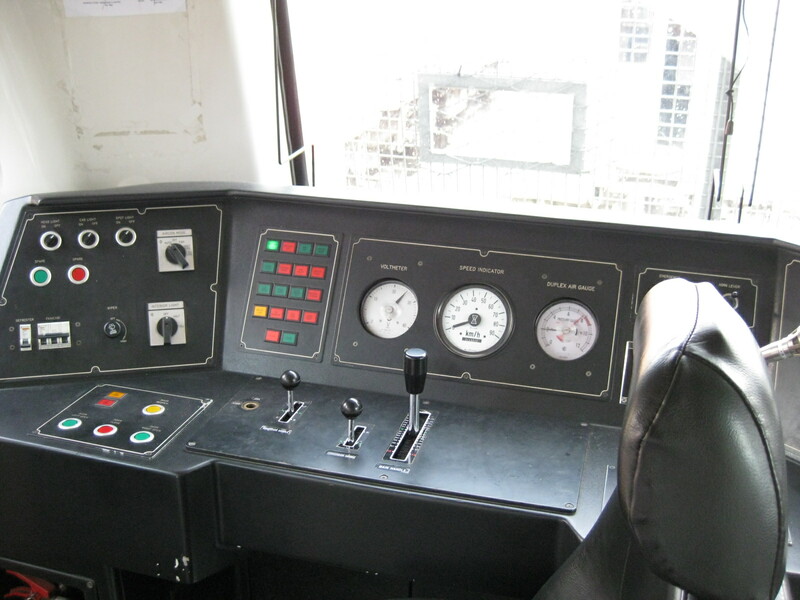 Control panel – the lead car of the train features this more modern panel for the train controls. Note also the grills on the windshield of the train to mitigate the impacts of stones or other items thrown at the train as it rolls along its tracks near communities that include informal settlers. Exit route – when our train reached the depot, we had to climb down from the train as there were no platforms in the area. For this, one had to climb down backwards and feel for the steps just below the doors. 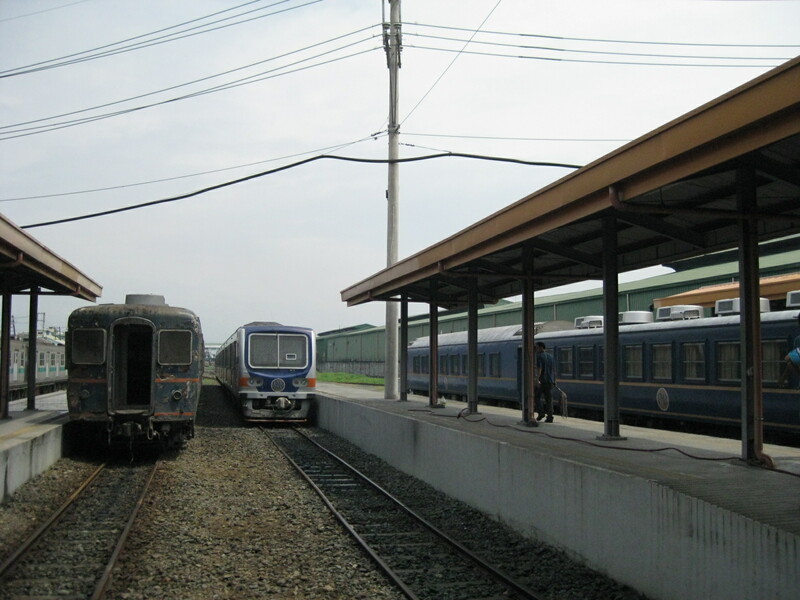 Maintenance yard – one of the newer commuter trains from Korea undergoing maintenance work at the depot. The coaches on the right are also Japanese donations for refurbishing, and are fitted for long distance travel though not as comfortable as the recliners or sleeping cars. These are more for longer distance commutes like from Laguna to Manila, which are similar to commutes along the JR Tokaido Line. Crash victim – one of the commuter trains was involved in a crash when a truck proceeded despite the warnings and the barriers indicating an approaching train. That effectively knocked out one train and will cost the PNR a lot to repair the train. There are still many issues pertaining to safety along rail crossings, and many motorists and pedestrians remain hardheaded (pasaway?). As the PNR increases its frequencies for both its commuter and provincial services the subject of safety will become more serious and one that needs much attention. Briefing – colleagues ask our hosts about operations and other matters concerning the PNR today. Our students also had the opportunity to ask about employment possibilities at the PNR including what qualifications are needed for railwaymen. From JR to PNR – those are more Japanese trains in the background. We were not really surprised about the conditions of the trains considering that JR does a great job maintaining their trains given their usage. Recruitment pitch – our students had plenty of questions for our host including those about the trains and the history of the PNR. 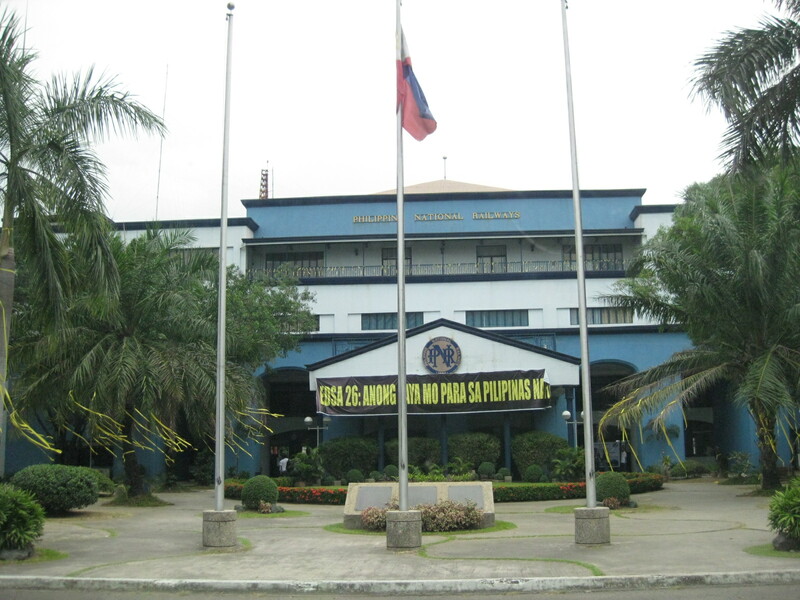 They were informed that the Polytechnic University of the Philippines (PUP) has a baccalaureate program in Railway Engineering and that our host taught courses there. When asked where the graduates go for employment, our host mentioned its difficult for them to get employment locally as railway engineers and that the program will soon terminated. Noontime rush – back at Tutuban Station, we witnessed passengers alighting at the station and walking towards the exit. 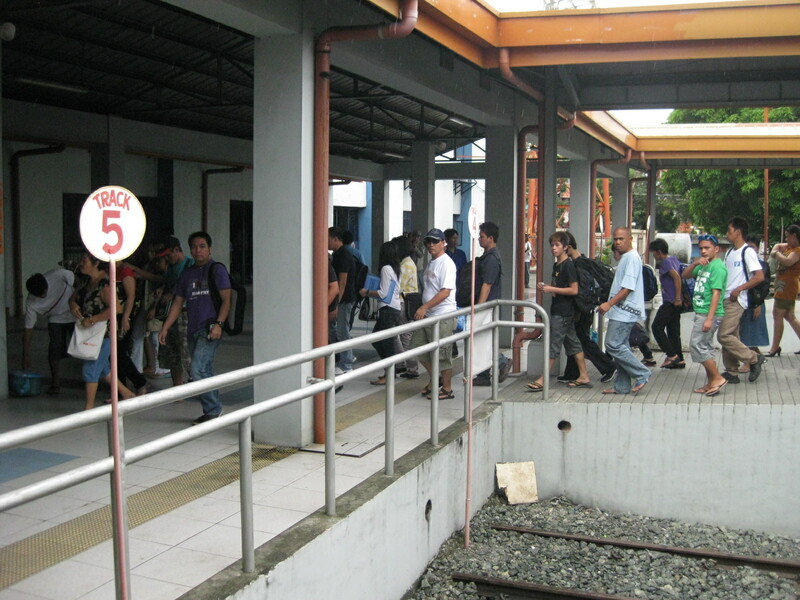 The number of passengers was significant considering the limited capacity of the trains and the fact that it was already noontime. There are probably more passengers during the morning and afternoon peak periods. 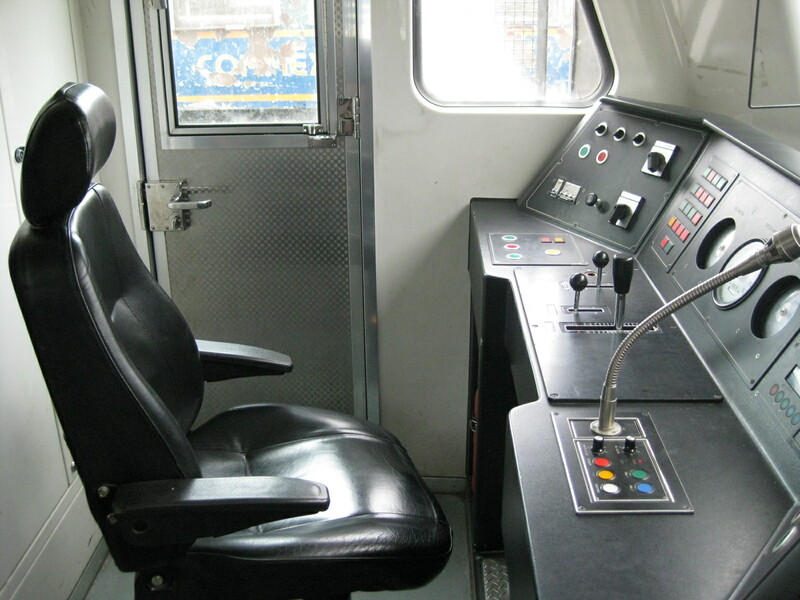 Driver’s seat – I took this photo when we boarded our train from Tutuban to Espana. Our hosts were very kind and generous to allow us to ride in the cockpit where all the action takes place. We also got a firsthand experience of what the driver had to go through (his hand was practically on the horn the whole time he was running the train) to earn a living. All aboard! 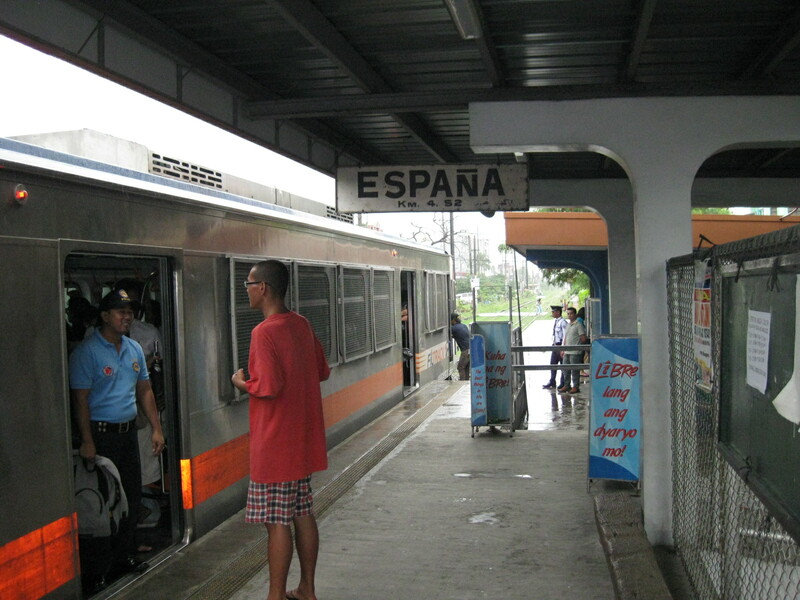 – the Espana Station platform after all passengers have boarded the train. One passenger seems to be talking to the security personnel at one of the doors. 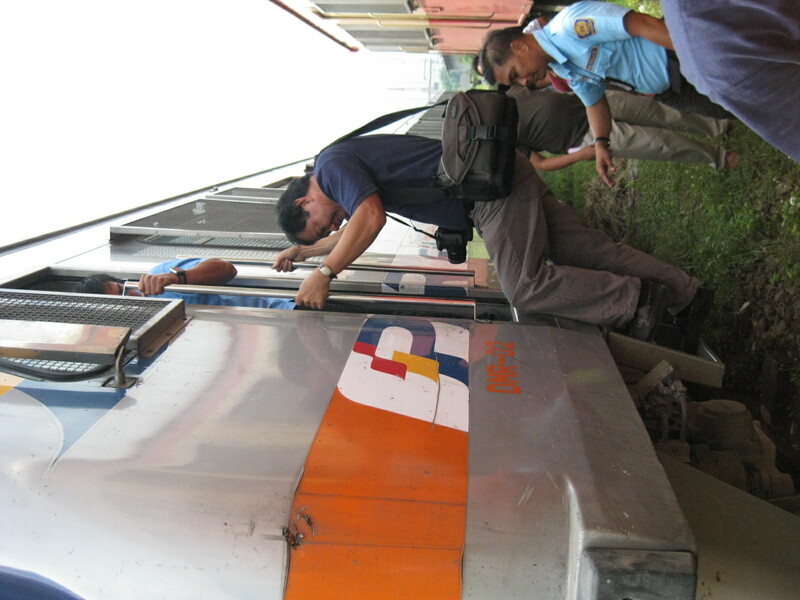 The DOTC and the PNR posts security staff on the trains to ensure safety and security on-board. Their presence is a deterrence against criminality including snatchers and con-men who prey on students and the inattentive. 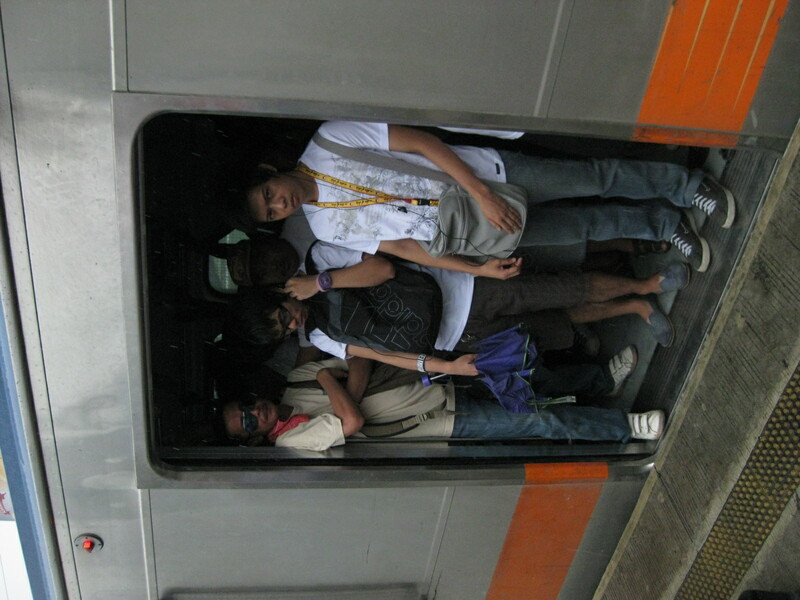 Capacity – the train is filled with passengers, underlining the demand for more efficient public transport services in Metro Manila. This, despite the fact that trains have 30-minute headways. 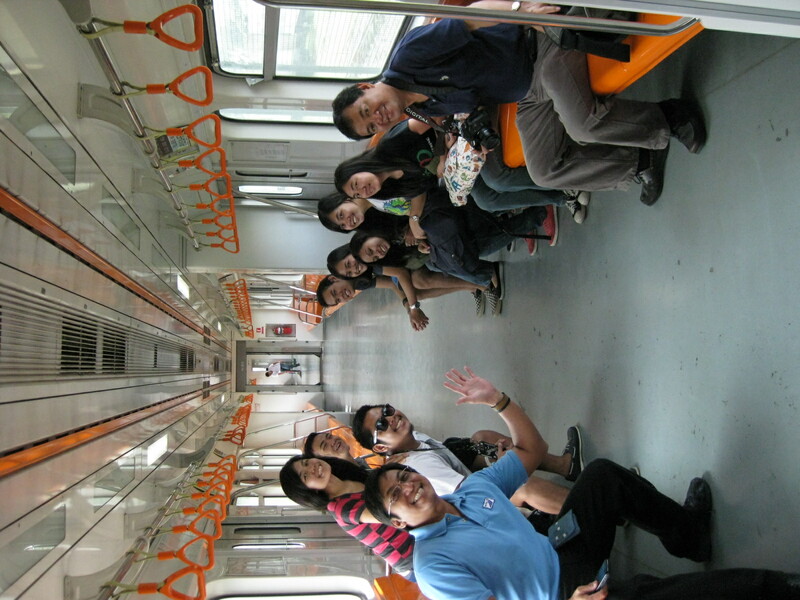 The PNR commuter line provides an inexpensive alternative to commuters. 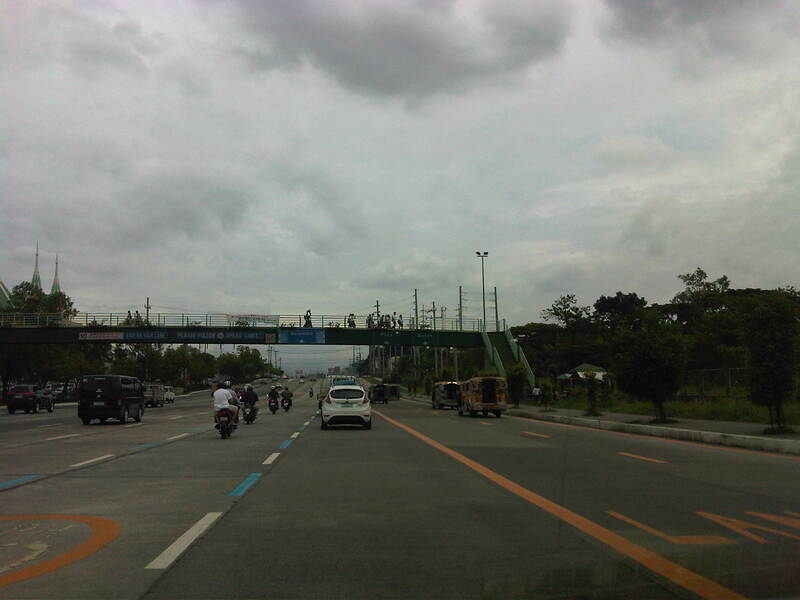 Crossings – the junction at Espana Avenue in Manila is among the busiest given the road traffic along this major arterial. If the PNR will increase service frequencies (and therefore capacity), this will result in higher likelihoods for crashes involving trains. During our short ride from Tutuban to Espana, we already saw a lot of crossings along the railways that require much attention and safety devices. 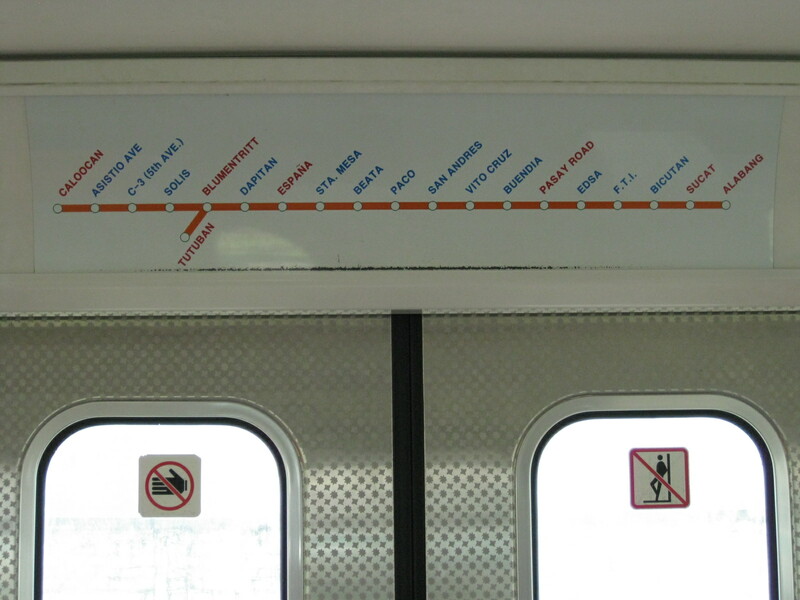 Line diagram – like most trains, the PNR displays information on the stations along its commuter line. We visited their main station at Tutuban and rode a train from there to Espana. I can imagine that the stations listed in red would be express stations in the future but then conspicuously “blue” are Paco and Buendia Stations, which I believe should be major stops for the PNR. I was waiting for the boarding call for my flight and took the photo below of passengers deplaning via the stairs at the aft door and the air bridge. These were loaded unto the waiting buses, which ferried them to the terminal building. For all those buses with their drivers, fuel and emissions, wouldn’t it have been more cost efficient to just operate the airbridge and let the passengers use this facility rather than have them take the stairs (and without assistance for the elderly and those with babies or small children)? From an environmental perspective, wouldn’t use of the air bridge make more sense in terms of reducing carbon footprints as well as fuel consumption?